In the video below you will learn how to apply an antique finish to an ornate, beautifully carved maple hardwood corbel shelf support. In order to make the unfinished maple corbels look stunning, there is a three step process you will need to get familiar with. I went overboard the other day after watching a Youtube video about organizing your kitchen. So inspired, within twenty minutes I had made my kitchen more functional by rearranging almost everything. Now, I’d like to share how you can make the most used room in your home more efficient through organization. If your bathroom vanity is lacking flare and curb appeal, try covering it with a peel and stick stainless steel coating. The contact paper or PVC film comes in rolls that you simply apply to the cabinet parts. All you will need is a clean smooth surface, a sharp blade, vibrating sander, sand paper, blow dryer and a credit card. 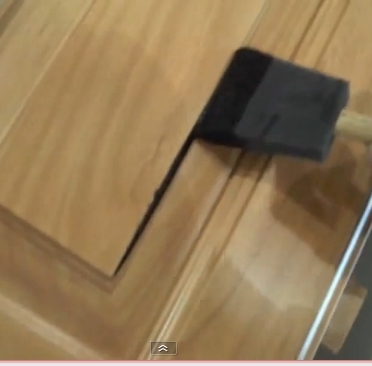 The video below demonstrates glazing techniques for kitchen doors. If your existing cabinets are clear coated, this is a great way upgrade old doors by adding a nice pin strip. It’s an easy refinishing process that takes a little specialty stain and a can of clear spray lacquer. You will be able to apply this dark antique brown color everywhere that it will stick on routed details or in the crevices of your cabinets. Important: Before applying any of the spray lacquer, test compatibility on a small area on the back of one of your kitchen cabinet doors. If the paints fight with each other, try using a spray polyurethane. Lacquer is preferred because it will dry in a few minutes compared to long drying times associated with other top coats.